Lots of lovely babies in the studio this week. I run a ‘KidsClub’ offer, with (usually) three studio visits over the first year, at 4 months, when they are able to lift their head, at 8 months when they can sit up, and at 12 months when they can stand. Not everyone want to have their kids featured on a website or social media of course, but thankfully, these two lovelies had no such reservations. Baby Daisy, celebrating her 1st Birthday with a special cake. Baby Edison, at his eight month session. Photographing cats in the studio is never easy. The sudden flash of the lights seems to hurt their sensitive eyes, and after one shot they flee, terrified into some nook or cranny, in the hope of hiding away. Sometimes, even when they are being held by their owner, they will become so agitated that they will claw and bite their way to freedom. 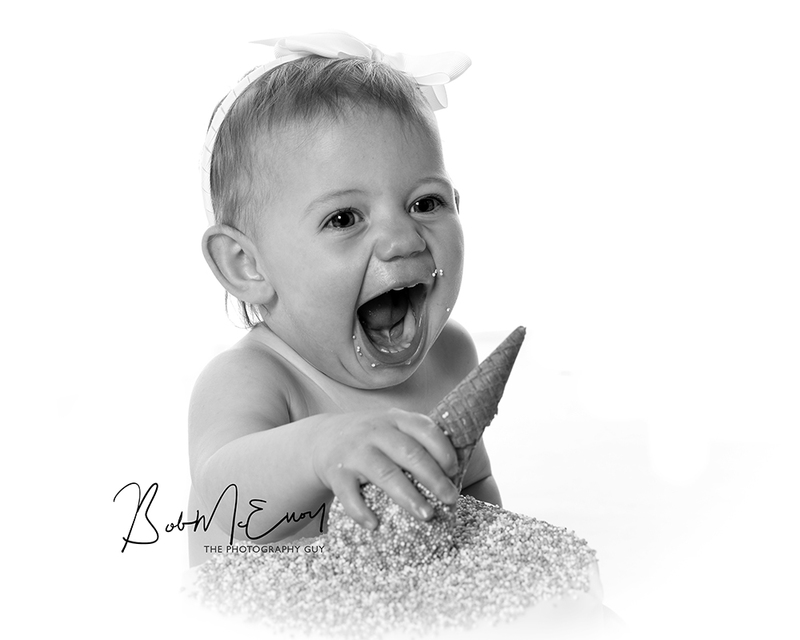 They create interest and make a baby shoot irresistible! I found this wooden boat in a new shop in Belfast and immediately I thought it was well worth the £25 or so that it cost! Combine it with a green backdrop and a couple of lights in the studio and it’s a great asset! And young Arlo here seems to be enjoying it too! Valentines Proposal – or already engaged? Or just in love? Just got engaged? Just happy together? Celebrate with a romantic couples photoshoot and celebrate your love together with images you will cherish forever. GREAT AS A GIFT TOO! A romantic, fun and loving photoshoot of the two of you. The photoshoot is in our fully equipped studio with hi-key and photo-noir and with a cool mix of love, romance, fun and togetherness. All images you choose are fully retouched and airbrushed as required. Just £25 for the photoshoot and free print. At your relaxed viewing session you will be able to choose your complimentary 8 x 10 inch print and any additional prints, albums or digital images you want. 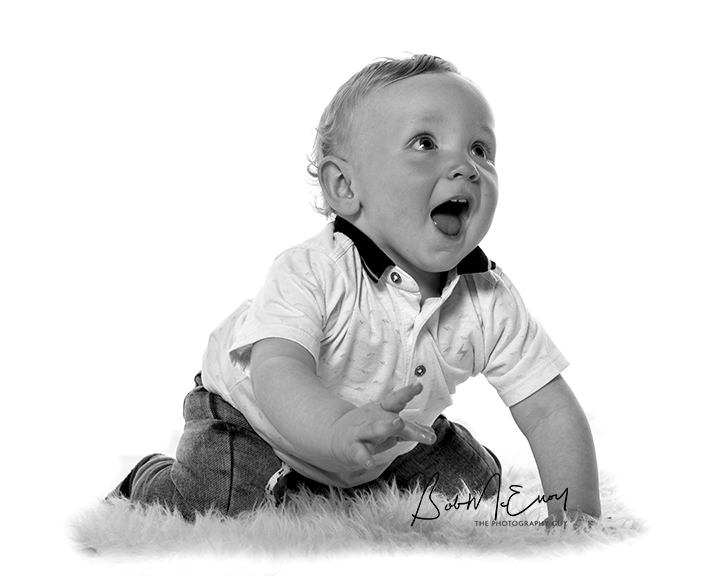 Baby James visited the studio today with Mummy and Daddy to pose for the camera. It’s his third visit as part of his ‘Baby’s First Year’ photography package. What amazing childhood memories! You know you are going to get some terrific family images that you will treasure forever. You are also worried that your youngsters (or husband) are going to be a nightmare. Just keep relaxed yourself and all the rest of the family will be fine too. So here are some quick tricks you can apply at any moment you feel a slightly stressed, not only at your photoshoot. Count slowly down from 10. As you count down, just breathe slowly and unwind your shoulders. In through the nose, out through the mouth. Calm, slow, deep breathing is a well known relaxation technique. If your infant is being a little monkey, then pick them up, give them a tickle and tell them in a happy way they are being a little monkey. Be prepared to be silly. Maybe both you and your kids need the tension breaking. A quick game of piggy back, or walking like a chicken, dancing, singing or spinning might be all it takes to go to the next level. Really, that is when it is all going to go wrong. We understand that children won’t always co-operate and we are happy to work round it. If they are not doing what we’ve asked, then we will change tack and shoot something around them. It’s a cold snowy day here – so full marks to baby Callen’s mum and dad for venturing out in the bad weather to come to Dundonald and visit the studio. We were rewarded with lots of lovely pictures and smiles, and a happy little boy who thoroughly enjoyed the experience. But when you ask Callen to sit up and smile for the camera, don’t be surprised if he makes himself comfortable and waves his feet in the air – just for fun!